and designed to withstand the elements. Its winding crown tube is in satin-brushed steel, new for the Black Bay line and aesthetically in keeping with the case and winding crown. Its contrasting black dial means that it is legible in all conditions, including night-time, thanks to its luminescent hour markers. The dial features a GMT marker at 6 o’clock. 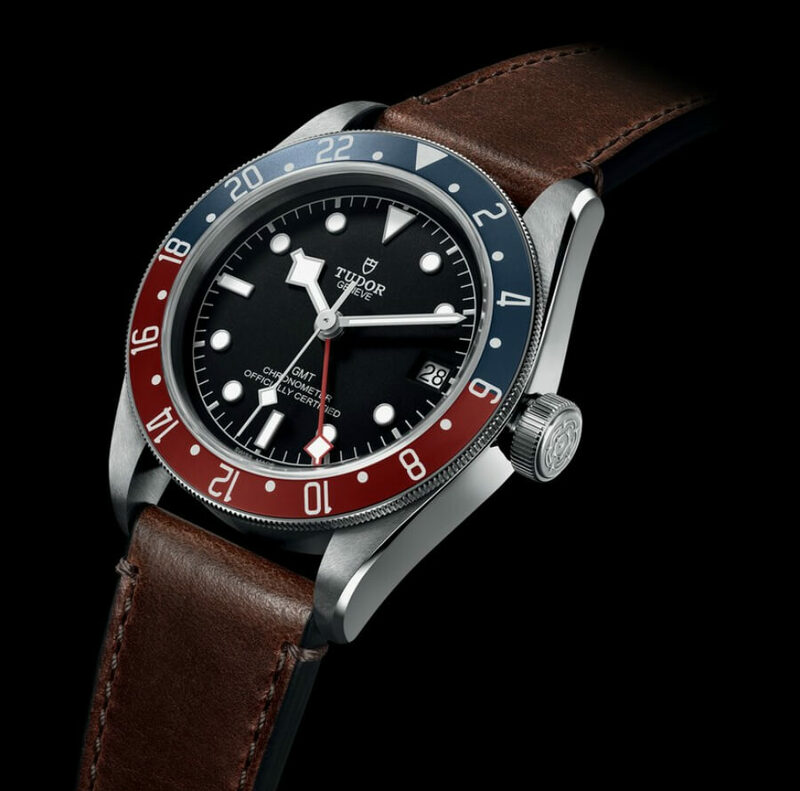 A new Manufacture Calibre with the reference MT5652 has been developed by Tudor for the Black Bay GMT model. 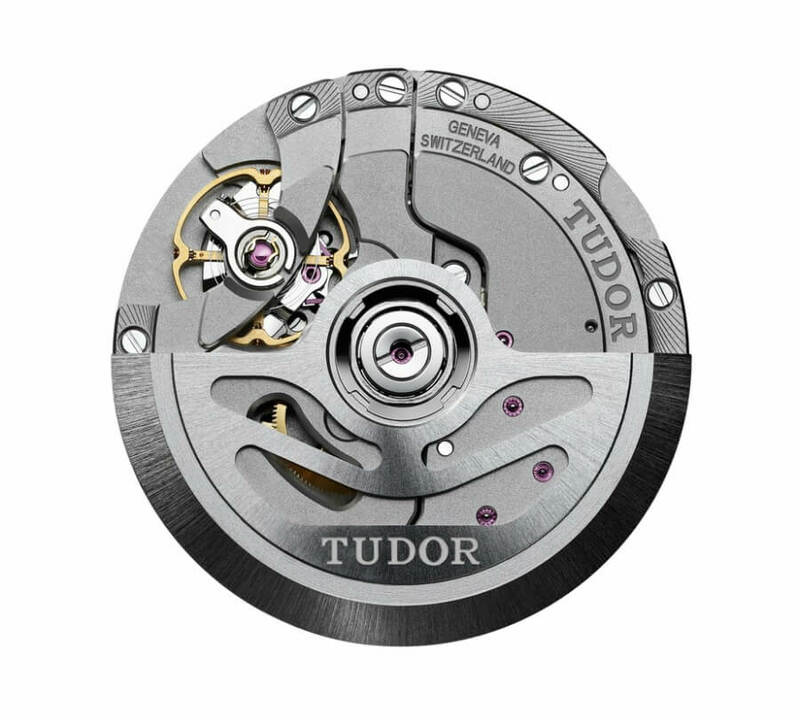 This introduces a new function to the line of Tudor Manufacture Calibres, an apt demonstration of Tudor’s approach to technical development. The integration of new functions is allowed by a flexible architecture, rather than by adding ever more complicated modules. A defining detail and a must for purist watch enthusiasts. The Calibre MT5652 has the appearance and finish typical of Manufacture Calibres. Its openwork rotor is satin-brushed with sand-blasted details and its bridges and mainplate have alternate polished sand-blasted surfaces and laser decorations. Its structure has been designed to ensure robustness, longevity and reliability, as has its variable inertia balance, which is maintained by a sturdy traversing bridge with a two-point fixation. Thanks to these qualities, together with its non-magnetic silicon balance spring, it is certified as a chronometer by the Swiss Official Chronometer Testing Institute (COSC). With a 70-hour power reserve, a wearer can take off the watch on Friday evening and put it back on again on Monday morning without having to re-set and wind it. The bracelet of the Black Bay GMT model is inspired by the folding riveted bracelets of the Tudor watches produced in the 1950s and 1960s. These were famous for having visible rivet heads that attached the links, as well as a stepped construction. These two aesthetic details are incorporated into the bracelet of the Black Bay GMT model, integrating modern manufacturing methods using solid links. Two additional designs are available: “Terra di Siena” brown leather strap and folding clasp or black fabric strap with a burgundy band. 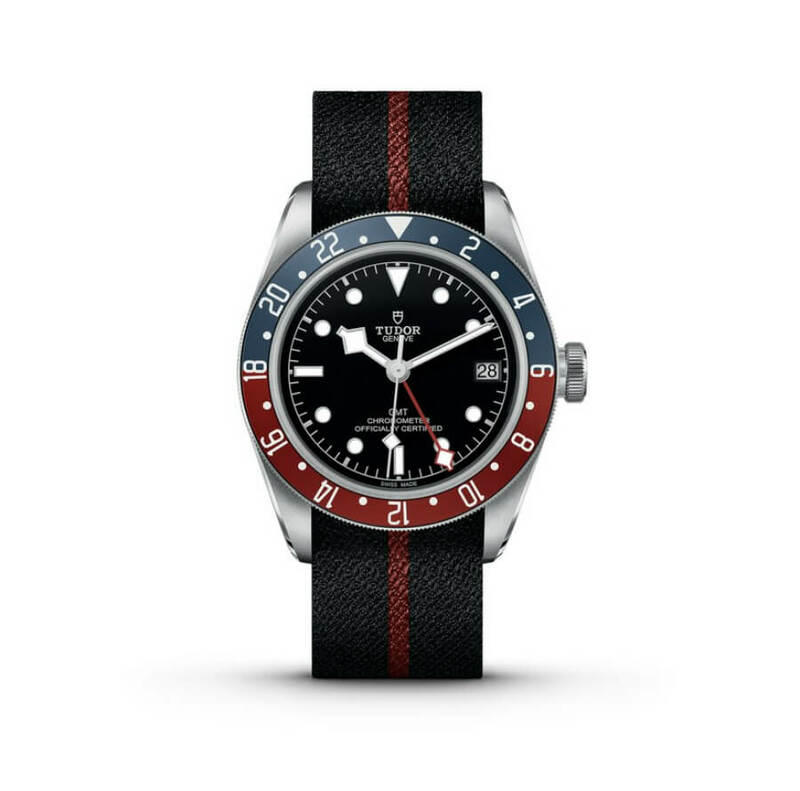 Made using 2/5 the Jacquard technique, a traditional method achieved by a 150-year-old family firm from the St-Etienne region of France, this strap is a signature feature of Tudor, which is thought to be a pioneer in this area. Like other models in the Black Bay line, the Black Bay GMT features a dial inspired by the TUDOR divers’ watches produced during the 1950s. They adopt the characteristic angular hands known to collectors as snowflake that appeared in the brand’s 1969 catalogue. 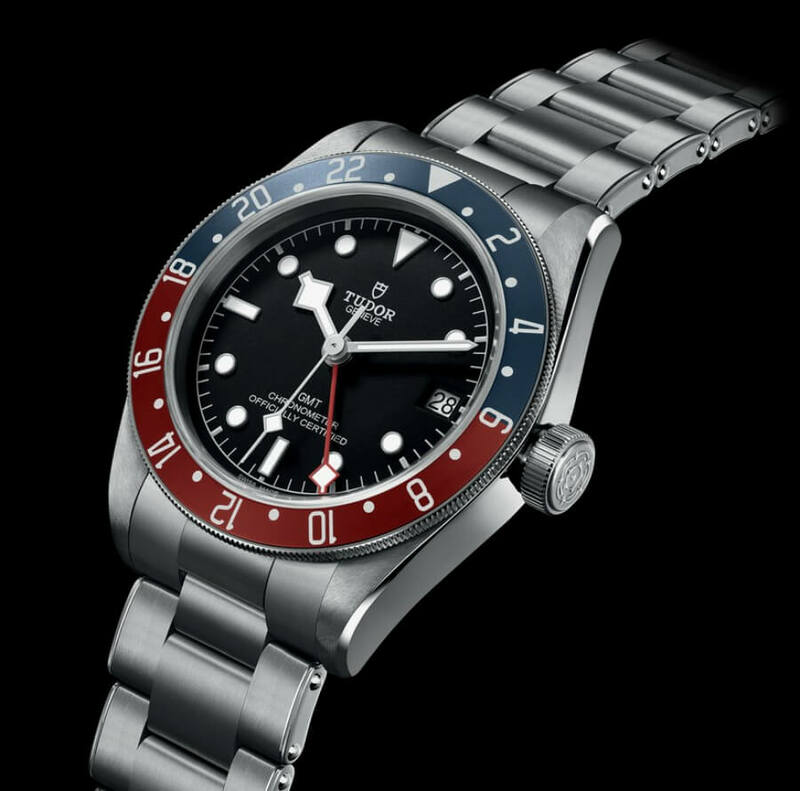 Lastly, the large winding crown, characteristic of the first generation of Tudor divers’ watches to be waterproof to 200 metres (660 ft), is also adopted in this new model. The Black Bay line is the result of the 3/5 subtle blend of traditional aesthetics and contemporary watchmaking. Far from simply being an identical re-release of a classic, it brings together over 60 years of Tudor divers’ watches at the same time as being resolutely anchored in the present. Whilst it is neo-vintage in conception, its manufacturing techniques, reliability, robustness and the quality of its finish are consistent with today’s more rigorous requirements. 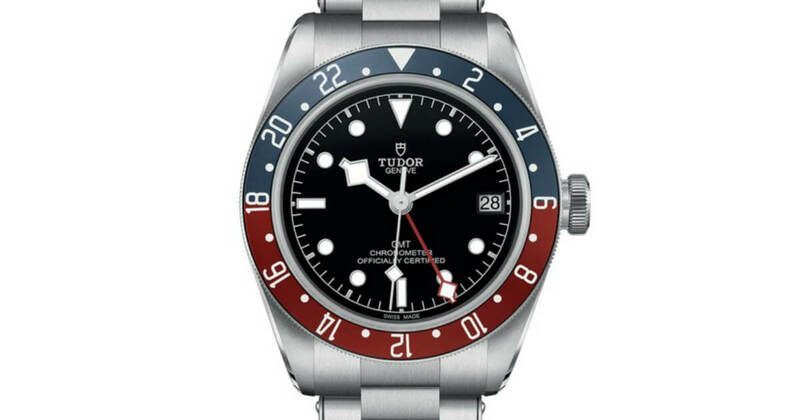 The price for the Tudor Balck Bay GMT starts from CHF 3,400 depending the strap or bracelet you choose.